MMarcell, population 453, is the hub of the Edge of the Wilderness National Scenic Byway. A Township of 56 square miles, it contains all or part of 48 lakes. Tourism is Marcell's biggest industry, and the population swells during the summer. Part of the Northern Itasca Joint Powers Board, Marcell has the look and feel of a small town; peace and quiet in the most natural of settings. It is the birthplace of ASV, the all-terrain vehicle manufacturer. The Edge of the Wilderness Discovery Center, located north of town, provides services and information to travelers and local visitors and is the center for information concerning the "Edge of the Wilderness" National Scenic Byway. Marcell is an unincorporated community in Marcell Township, Itasca County, Minnesota. Minnesota State Highways 38 and 286 are two of the main routes in the community. According to the United States Census Bureau, the township has a total area of 57.2 square miles (148.1 km²), of which, 47.9 square miles (124.1 km²) of it is land and 9.3 square miles (24.0 km²) of it (16.21%) is water. The elevation is 1,355 ft (413 m) above sea level. As of the census of 2000, there were 394 people, 179 households, and 132 families residing in the township. The population density was 8.2 people per square mile (3.2/km²). There were 567 housing units at an average density of 11.8/sq mi (4.6/km²). The racial makeup of the township was 98.98% White, 0.51% African American, 0.25% Native American, and 0.25% from two or more races. There were 179 households out of which 17.9% had children under the age of 18 living with them, 68.2% were married couples living together, 5.0% had a female householder with no husband present, and 25.7% were non-families. 23.5% of all households were made up of individuals and 8.4% had someone living alone who was 65 years of age or older. The average household size was 2.18 and the average family size was 2.53. In the township the population was spread out with 14.0% under the age of 18, 3.6% from 18 to 24, 18.0% from 25 to 44, 40.4% from 45 to 64, and 24.1% who were 65 years of age or older. The median age was 53 years. For every 100 females there were 106.3 males. For every 100 females age 18 and over, there were 114.6 males. The median income for a household in the township was $39,167, and the median income for a family was $41,719. Males had a median income of $31,250 versus $30,625 for females. The per capita income for the township was $21,010. About 9.2% of families and 8.5% of the population were below the poverty line, including 7.8% of those under age 18 and none of those age 65 or over. The Marcell area was first surveyed in 1870. Lumbermen like T. B. Walker took up land in the late 1870's and early 1880's. John Lundeen from Wisconsin filed for homestead in 1899 and was the first settler to offer a final proof of his claim. He and his wife Katie moved to an area near Marcell on Big Turtle Lake in 1901, where he built a store, a home, a restaurant and a sawmill intended to service homesteaders and people working for the Itasca Lumber Company. By the end of 1901, the railroad had completed a railroad spur to the lake and put two steamboats into Big Turtle to load logs. In 1902, Katie Lundeen applied for a Post Office to be named Turtle Lake. The postal authorities said there were too many Turtle Lake post offices in Northern Minnesota, so she submitted her application with the name Marcell, a name honoring Andrew Marcell, the first conductor on the Minneapolis and Rainy River Railroad, more commonly known as the "Gut and Liver". 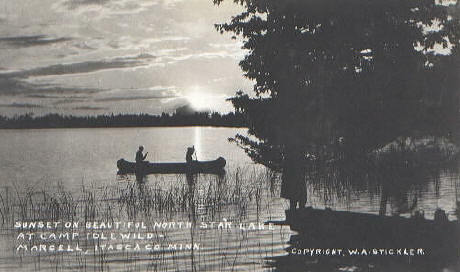 In 1905 a petition was presented to the Itasca County Board of Commissioners to establish the township of Big Turtle Lake, and the first election was held in 1906. The first supervisors of the township board were Oscar Harbin, John Sundloff, and Matt Zimmer. Albert Jaynes was elected treasurer, and John Lundeen was elected town clerk. One of the first orders of business was to change the name of the township from Big Turtle to Marcell. The town of Marcell at the Big Turtle Lake location did not remain there long. Lundeen's store, post office, and warehouse burned in 1910. The Deer River News reported a loss of $4,000, a considerable amount at that time. "Old Marcell" was no more. Today none of the old buildings remain. Being an astute businessman, John Lundeen decided to rebuild in the area where the present community of Marcell now exists. There had been plans to extend the Minneapolis and Rainy River Railroad from Alder to the Canadian border, serving the towns along the way, and this would have put Lundeen's new store in an advantageous spot. In 1914, Marcell built its first school, which was replaced by a larger school building in 1936. In 1957 the school district closed its many rural elementary schools, and elementary students now attend school at North Elementary School near Talmoon, and high school students are bussed into Deer River. The railroad ceased running into Marcell in 1933, and was followed by the construction of Highway 38 which supplied a direct route to Grand Rapids and Bigfork. This opened up the area to tourism and many resorts came into being and flourished. Camp Idlewood, started in 1912 by Walter and Rose Stickler, was one of the better known operations and had a wide following. There were 33 guest cottages with rates of $12 per day per person for room and board. Another noteworthy resort in the Marcell area is Arcadia Park. Located on the west side of Big Turtle Lake, Arcadia has one of the most spectacular views in all of Northern Minnesota. Started in 1922 as a community of individual homes and cabins, Arcadia soon had a main lodge and cabins to rent. Electricity came to Marcell in after World War II in 1945, and the area flourished. Celebrate our northern hospitality, hometown pride and the treasures of our natural heritage. Minnesota, midway between America's east and west coast, is the home to 12,000 lakes. It is filled with beautiful country and all the pleasures of the four seasons. The Edge of the Wilderness is the rustic slice of this great state, with more than 1,000 lakes and one mighty river nearby, all in landscapes of remarkable natural beauty. There are still more trees than people here -- offering you classic northwoods seclusion. A primitive & non-motorized area set aside within the Chippewa National Forest. It has 21 miles of trails and numerous small lakes. Sort of a miniature version of the boundary waters canoe area. Suomi Hills has gorgeous fall colors and good grouse hunting! Wilderness Willie Trail starts in Effie and heads North/East towards Togo. The 25 mile trail is maintained and groomed by the Snowdrifters, connecting the Effie Connection to the Circle T Trail. Effie Connection starts in Bigfork, heads North and then connects to the Caldwell Brook Trail which leads to Gemmell, Minnesota (the Blue Ox Trail system.) The Snowdrifters maintain and groom 16 miles of this trail. Of the Bowstring Trail, the club maintains and grooms a little over 15 miles of trail. Marcell Trail begins South of Marcell (at the North end of the Suomi Trail) and heads North connecting to the Bowstring Trail, the Cameron Lake Trail (the club grooming and maintaining 14 out of the 18 miles), the Effie Connection and the Bigfork Lions Trail (6 miles of which is the club's responsibility) which is a total of 25 miles. There are many little 'spurs' that the Snowdrifters maintain and groom also. The park features 2 tennis courts, a basketball court, softball field, walking/biking/inline skating trail, playground equipment, picnic area, horseshoes & volleyball court. 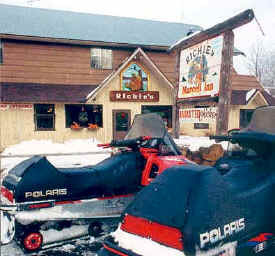 Richie's Marcell Inn offers comfortable motel rooms with direct access to three area snowmobile trails. Restaurant, liquor lounge, gift shop, game room, live music. 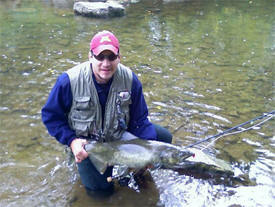 Great fishing in the immediate area. Timberwolf Inn is a newer 12 unit, log-sided inn with a large corner fireplace. The Inn houses a full service restaurant with full menu & a liquor lounge. Off sale is available. There is direct access to three area snowmobile trails. Big Timber Resort on North Star Lake offers 7 modern lakefront housekeeping cabins with 2 or 3 bedrooms. 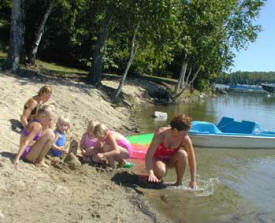 The resort features 450' of shallow sand beach and a fantastic children's playground. 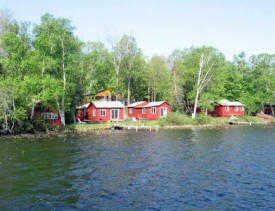 Camp Jack-The-Horse Resort offers 5 modern housekeeping cabins on Jack The Horse Lake with either 2 or 3 bedrooms. The lake is surrounded by mostly undeveloped federal land, and Camp Jack The Horse is the only resort on the lake. The resort specializes in providing a peaceful, relaxing retreat from everyday noise and disturbances. "A Hidden Beauty", Cedar Point is in the Chippewa National Forest located on the Edge of the Wilderness National Scenic byway. Just 28 miles north of Grand Rapids, Minnesota and 3 miles from the town of Marcell. Our guests are always commenting on our well shaded, lake level grounds. You will find plenty to do whether it be hiking, fishing, pontooning, or visiting the local towns of Marcell or Grand Rapids. Our 79 acres, surrounded by state and undeveloped private land, ensures a quiet getaway. We are the only resort on Fox Lake. We have many wonderful activities for our guests! Our crisp, warm summer days allow for many hours of boating, canoeing, FISHING, or just taking a walk down our quiet lane. At Fox Lake you can enjoy Minnesota's beautiful sunrises and sunsets. 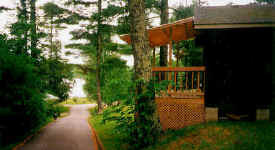 Hillcrest Resort on Hatch and Turtle Lakes offers 7 modern housekeeping cabins with two or three bedrooms. The lodge has comfortable guest rooms, available year round for "Bed and Breakfast." Lodge open year around, restaurant, gift shop, game room, playground, beach and much more. Great Large & Smallmouth Bass, Northern, Walleye, Crappie and Bluegill Fishing. If you are looking for a great family vacation, with excellent fishing, lots of activities, and a very nice spacious vacation cabins while remaining in a quiet, relaxing north woods setting, look no further. We provide all this and more on 28 beautiful acres! We are nestled in with some of the largest pine trees in the heart of the Chippewa National Forest right off of one of the most scenic roads in the state, the Edge of the Wilderness Scenic Byway 38. 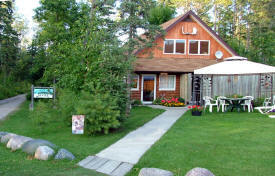 North Star Lake Resort welcomes you to your vacation home away from home. Relax amidst the beauty and solitude of Minnesota's great Northwoods. Located next to the Edge of the Wilderness National Scenic Byway, we are inside the 400,000- acre Chippewa National Forest. There are more than 1,200 lakes within a 50-mile radius! 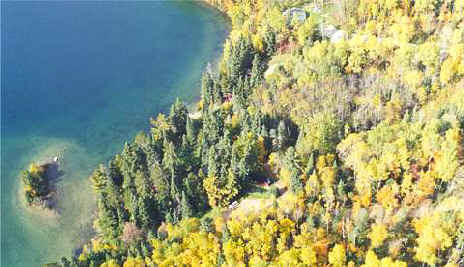 The resort is located at the north end of beautiful Spider Lake, surrounded by the beautiful Chippewa National Forest. 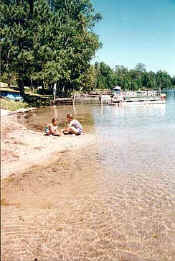 Spider Lake has many miles of undeveloped shoreline with many bays and points. The lake is nearly 4 miles long and offers fishermen numerous opportunities to catch walleye, muskie, northern pike, largemouth bass, smallmouth bass, perch, crappie, bluegill and sunfish. 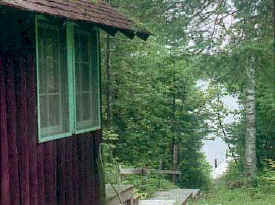 Buckhorn is a unique group of five chalet-like cottages nestled among the tall pines along the shore of Caribou Lake. A new addition is a large log cabin, open year-round. Originally an early hunting & fishing camp, it has become a quiet, secluded hideaway for vacationers seeking privacy and relaxation. The well-spaced cottages along 1,000 feet of Caribou's shoreline assure this luxury. Located in beautiful Marcell, Minnesota, and surrounded by lakes and trees, Frontier Sports can truly be called a "one stop shop". We offer a wide range of Sporting Goods for all of your hunting and fishing needs, and you'll want to shop in our gift shop area where we have a large selection of unique Northern Minnesota gift items. Frontier Sports is also a full-service convenience store, complete with groceries and a beautiful Deli area! MN Lakeshore Properties represents all types of real estate offerings from lake homes to acreage; and we specialize in Minnesota lakeshore lots, lake cabins, exclusive retirement lake homes and seasonal acreage or property. We live and work in this area known for excellent hunting, fishing, snowmobiling, 4-wheeling and family recreation. Whether you're looking for residential or lake homes for sale, land for sale, or lake cabins and lake lots for sale, no other real estate company is better suited to assist you with your real estate needs. Rustic Remedies provides an all-inclusive camp setting for Fisherman, Hunters and Wilderness lovers visiting the North Woods of Minnesota. Spike Camps can be set anywhere by our choosing or yours. Lodging in is canvas outfitter tents and meals are cooked over an open fire by the staff. Stays are seldom interrupted by other vacationers and always interrupted by nature. The Marcell Ranger Station was constructed between 1934 and 1936 by the Civilian Conservation Corps from the Inger and Day Lake CCC Camps. The Corps worked under the direction of the United States Department of Agriculture Forest Service. The facility was built to serve as the administrative headquarters for the Marcell Ranger District, which was established in 1933-34. Originally consisting of six Rustic Style buildings, only five remain today. The Main Office was replaced in 1967 by the current office building. The lure of Minnesota's Northwoods is unmistakable. Generations of families vacation here year after year, returning to bask in the ambience of the tall pines, the clean fresh air, cool, clear lakes and rivers, and warm hospitality. Sportsmen are drawn to the area in search of the magnificent fishing and hunting opportunities offered within our thousands of acres of state and federal public lands. The USDA Forest Service Marcell Experimental Forest (MEF) is an 890-ha tract of land located 40 km north of Grand Rapids, Minnesota. The MEF has been reserved for long-term research with the cooperation of the USDA Forest Service North Central Research Station, the Chippewa National Forest, the Minnesota Department of Natural Resources, Itasca County, and a private landowner. It is operated by the North Central Research Station, Research Work Unit 4351: Ecology and Management of Riparian and Aquatic Ecosystems, located at the Forestry Sciences Laboratory, 1831 Highway 169 East, Grand Rapids, MN 55744. The MEF contains six watersheds, each consisting of an upland portion and a peatland that is the source of a stream leaving the watershed. These unique features provide a wide range of hydrological environments to study. The Marcell Experimental Forest has a large historical database concerning soils, hydrology, and chemical cycling and transport. Climatic and hydrologic data have been collected continuously at monitoring stations since 1960. Six peatland / upland forest watersheds have been instrumented, and have been studied in detail, including hydrology, nutrient and mercury cycling and behavior, and release of organic carbon and acidity. Hydrologic monitoring and other related research continues at the MEF. 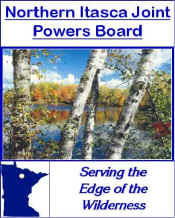 The Northern Itasca Joint Powers Board is comprised of five units of government in northeast Minnesota within Itasca County. The communities associated with the board lie 225 miles north of Minneapolis/St. Paul and 135 miles west of the seaport of Lake Superior, Duluth. The population of the area, commonly referred to as the "Edge of the Wilderness", is relatively sparse, with approximately 2,000 people residing in total. The population increases during the summer months with an influx of seasonal residents drawn to the numerous lakes for which the area is noted. Local news, weather, area info and Links to the northern Minnesota communities of Marcell, Bigfork, Effie and others. Located in the Chippewa National Forest, it also is home to The Edge of The Wilderness Scenic Byway. 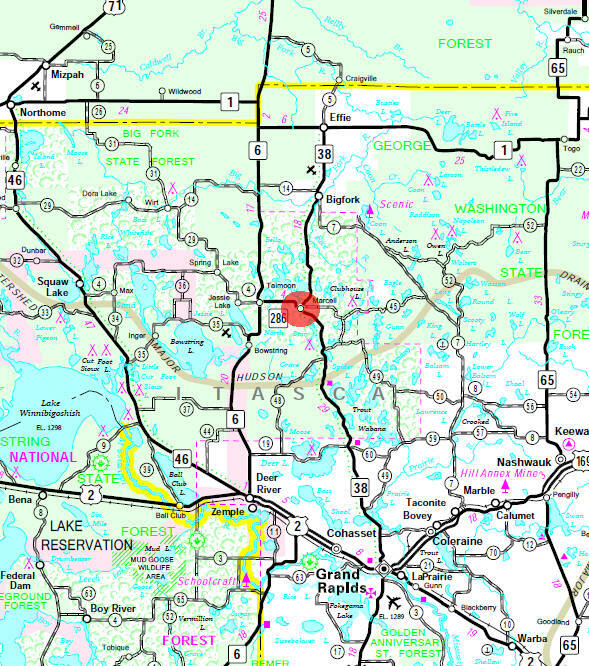 Located in Itasca County in northern Minnesota.